I am happy to be amongst all of you today in this energetic and vibrant atmosphere generated by your overwhelming participation in this Festival of Energy ‘Umang 2015’. At the outset, I compliment the Education Department of Govt. of Delhi, TATA Group of Companies and President’s Secretariat for this innovative programme. The Festival of Energy ‘Umang 2015’ with the theme - "Nayi Zindagi ki Umang, Swachh Urja ke Sang” - is a very timely theme, particularly when the whole world is brainstorming to halt the global warming, before the world becomes 2 degrees hotter than it was in the pre-industrial days. This is really a big global challenge for sustaining the habitation ecosystem. In the "2015 Paris Climate Conference”, leaders from all over the world have called upon to cut the carbon emissions and move towards sustainable living through sustainable energy. The energy production contributes to 35% of the global green-house gas emission, followed by industrial production 18%, agriculture 14%, transport 14%, deforestation 10%, construction 10%, waste and water treatment 6%. Today’s event addresses the most important component of green-house gas emission that is energy production. Domestically, if we can switch to clean energy to the maximum extent possible by utilizing the renewable energy potential in India, which is 8,89,508 Mega Watt, then it will be our single most contribution to a "clean and green” planet. Energy consumption is one of the important parameters for measuring Development Index of society. In spite of rapid development in India since independence, India continues to be the low per capita energy consuming country. This is primarily because of the reason that the installed capacity and availability of power is not keeping pace with the energy demand of the society and secondly, our energy eco-system is considered to be inefficient because of losses in transmission and distribution system and also because of use of low efficiency equipment in the country. India supports around 17% of the world’s population, but its energy and electricity consumption is just around 5% of the world consumption. It’s per capita consumption of energy and electricity is less than one third of the world average. In order to sustain a growth rate of over 8% through the next two decades, India will need to grow its primary energy supply by 3 to 4 times and electricity supply by at least 5 to 7 times of its current consumption. Therefore, we as a country, have a huge responsibility and challenge to meet our developmental requirements and at the same time ensure that we remain committed to clean energy. Through the contribution of each individual, we can achieve this task, which appears to be, if not impossible, but difficult. Climate change is now considered to be one of the most critical issues for the existence of natural eco-system and is also intrinsically linked to the sustenance of existing human civilization. Energy and environment are inter-related and at the same time their balanced co-existence is essential for society and civilization. India has been traditionally a fossil fuel driven energy economy. In future, this trend is likely to change with our emphasis on solar energy and wind energy. In this context, this Festival of Energy ‘Umang 2015’ is a laudable initiative to educate our future citizens as ‘Energy Ambassadors’ and it should be replicated all over the country. Today, the whole world has become inter-connected and we are citizens of a global village. What happens in one part of the world, impacts the citizens in other parts of the world. The success of inter-connectivity of communication and internet offers a possibility of connecting the whole world through Energy Grids to optimize the natural resources, time zones and habits of the people. We need to find innovative ways and means to create such a world based on "Energy Justice”. We must remember that if we are educating one child for energy related issues, then we are educating an entire family of 4 to 5 people. I will like to compliment the organizers for selecting this theme. The Smart Phone App ‘Sajag’ on Energy Education launched today, intended for educating the school children, is a unique initiative for empowering our younger generation. I have carefully noted the Pledge on the ‘Sajag’ App. This is a powerful way to imbibe sense of belongingness towards Mother Nature and commitment to preserve, nurture and care the ecosystem. An important decision tool like this App, which enables the young minds to measure their efforts, will definitely lead to a truly empowered generation. Each unit of energy saved is energy generated. To that extent, this initiative will really help in augmenting the capacity building in the country through education and empowerment. 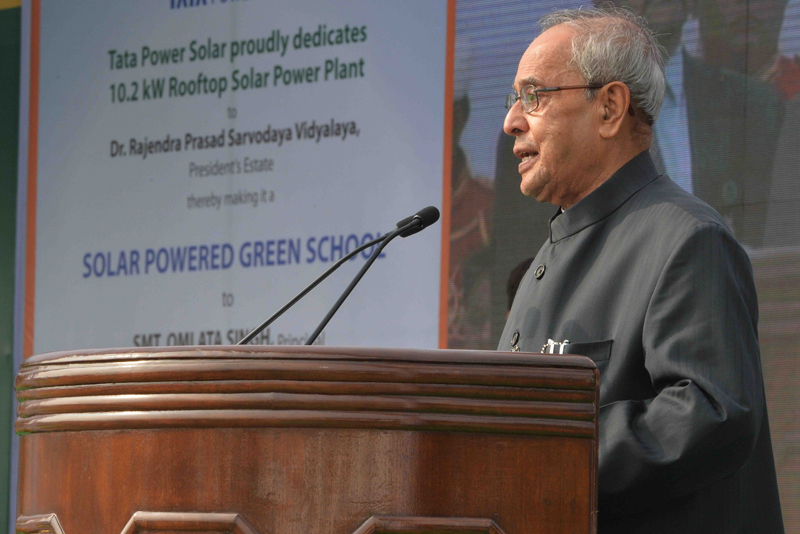 Today, I am also happy to see this school going ‘green’ through the initiative of Tata Power Solar Systems Ltd. This school will now have its energy needs met from solar power. I will like to see in future many more government schools going ‘green through solar power’ and contributing to the clean energy movements in the country. I hope the Education Department of Government of Delhi will take this initiative forward and make Delhi a Clean and Green City. In today’s exhibition, I have seen many innovative concepts brought in by young minds relating to energy. The setting up of ‘Energy Club’ in the school using the concepts and ideas generated from the minds of these youngsters will be a game changer in energy movement in the country. I hope that the vitality and constructive outcome of the Energy Club will really galvanize the energy scenario of the country and in the near future India will definitely move a step forward in achieving energy security. I would like to congratulate all the winners who have displayed their innovative ideas, projects and artworks. I am sure this will motivate others to think ‘out of the box’ and contribute to the clean energy movement. I would also like to convey my sincere appreciation to the senior management of the Tata Group for their visionary approach in dealing with the most relevant and important issue of Energy and collaborating with President’s Secretariat. My best wishes to the Festival of Energy ‘Umang 2015’ and to all the participants.